I grew up using a pressure cooker so they don’t scare me. My mom used to make potatoes in her olive green Presto and I loved how it sputtered and jiggled on the stove. I used mine for potatoes too and not much else. At VegFest, I watched Chef AJ’s cooking demo and she inspired me to get an Instant Pot. I started cooking dried beans and used it a couple times a week, but I never mixed and matched. Always one type of food, cooked or steamed. I just purchased JL Fields’ new book, Vegan Pressure Cooking because I wanted some recipes to make one pot meals. It’s a gorgeous book with tons of great recipes; many are gluten-free and all are vegan. I was inspired by a couple recipes, the Easy Applesauce and Fruit and Nut Rice Pudding. I’m notorious for letting inspiration take me down my own road and rarely follow a recipe unless it’s for cake or bread. I had a 4 lb. bag of apples that had almost been forgotten in the garage fridge. I also had a few dates left in a nearly empty container, begging to be used. 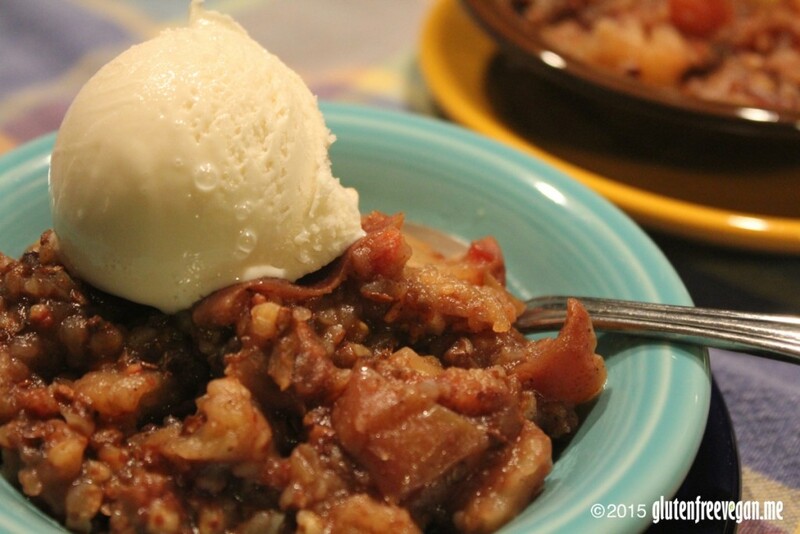 Inspiration led me to make this Apple Buckwheat Cobbler Delight. Thanks mom for curing me of the pressure cooker fear. Thanks Chef AJ for introducing me to the electric pressure cooker and thank you to JL Fields for writing such a beautiful cookbook and giving me the inspiration to mix a few ingredients together in my pressure cooker. Combine all ingredients in pressure cooker. Stir well to mix spices, water and buckwheat with apples. Cook for about 12 minutes (some pressure cookers are faster or slower so check with your manufacturer’s directions – I used Instant Pot on medium pressure). Serve warm or cold for dessert or breakfast and add a little vegan ice “cream” for a special treat. This entry was posted in breakfast, desserts, Recipes and tagged apples, breakfast gluten-free, buckwheat, dates, gluten-free vegan me, glutenfreevegan.me, glutenfreeveganme.com, healthy, pressure cooker, pressure cooking, vegan, vegan cooking, vegan pressure cooking, vegan recipes. Bookmark the permalink.